Perfect for the bow hunter. This model enables you to keep your hands on your bow or gun and call the trophy all the way in, or stop the animal right in your shooting lane. 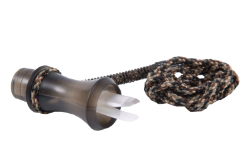 The soft flexible barrel allows you to bite down on the call putting pressure on the reed to produce fawn bleats, fawn distress calls, doe bleats, doe grunts or just blow without biting to produce buck grunts.